Antique - Diamond China Company of England (Blythe Porcelain) the Wild Flower Pattern Tea Set, 27-Piece Service for Eight, Circa 1905-35. This Art Nouveau Wild Flower Patterned Tea Set, having a Service for Eight, was made by the Diamond China Co. of England. A Lovely White China with Pink and Yellow Flowers, Foliage is in Autumn Colors of Rust/Yellow/Green/ Brown and 22kt Gold. All pieces are Trimmed with 22kt Gold. This China makes a truly Beautiful Tea Service, and goes well with many different Solid Color China Sets. In great Condition. This Art Nouveau Wild Flower Patterned Tea Set, having a Service for Eight, was made by the Diamond China Co. of England. A Lovely White China with Pink and Yellow Flowers, Foliage is in Autumn Colors of Rust/Yellow/Green/ Brown and 22kt Gold. All pieces are Trimmed with 22kt Gold. 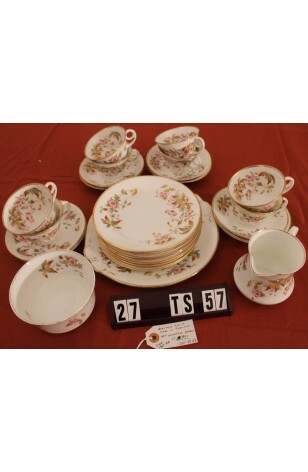 This China makes a truly Beautiful Tea Service, and goes well with many different Solid Color China Sets. In Great Resale Condition unless noted below or in pictures.